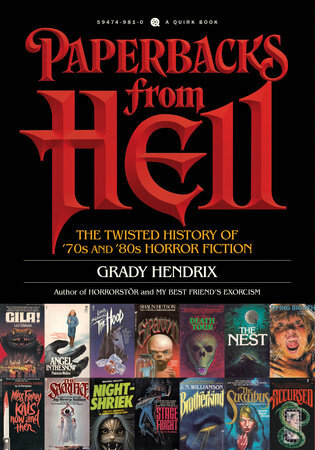 Too Much Horror Fiction: My and Grady Hendrix's Paperbacks from Hell Oregon Appearance, Oct 12, 2017! My and Grady Hendrix's Paperbacks from Hell Oregon Appearance, Oct 12, 2017! Paperbacks from Hell didn't magically pop out of my pants. I was assisted every step of the way by the evil genius, Will Errickson, of Too Much Horror Fiction fame. Will is a man who owns too many books, a man whose head is stuffed with too many facts, and a man whose name contains too man R's. Come hear us talk horror paperbacks until the crowd cries out for mercy. And we shall reply, "Never!" Big congrats. It's a beautiful book. Hope there will eventually be a tome 2.